U.S. waits for global response to latest avian flu outbreak. As of right now, the only farms with confirmed cases have been turkey farms. However, the Indiana State Board of Animal Health recently reported that a 155,000-layer facility that was not infected was being depopulated because the facility was considered in "dangerous contact" to an infected turkey flock. This brought the total number of birds affected to 401,163. Turkey supplies remain tight, and some turkey prices are near record levels, but turkey meat is still a very small portion of the overall U.S. meat supply, Steiner and Meyer noted. Because of this, turkey has no impact on the price paid for other proteins. “All along, the true risk was widespread infection in key broiler-producing regions,” they noted, adding that the risk this time may be lower than some think, given the industry’s experience with the disease. “At this point, we are more concerned about the bearish impact that new cases of bird flu may have on chicken and red meat prices,” they said. Many countries halted U.S. imports last year during the outbreak of highly pathogenic avian flu, which greatly affected the U.S. chicken market. The absence of export markets meant the U.S. had to absorb the increase, which ultimately sent domestic prices lower. 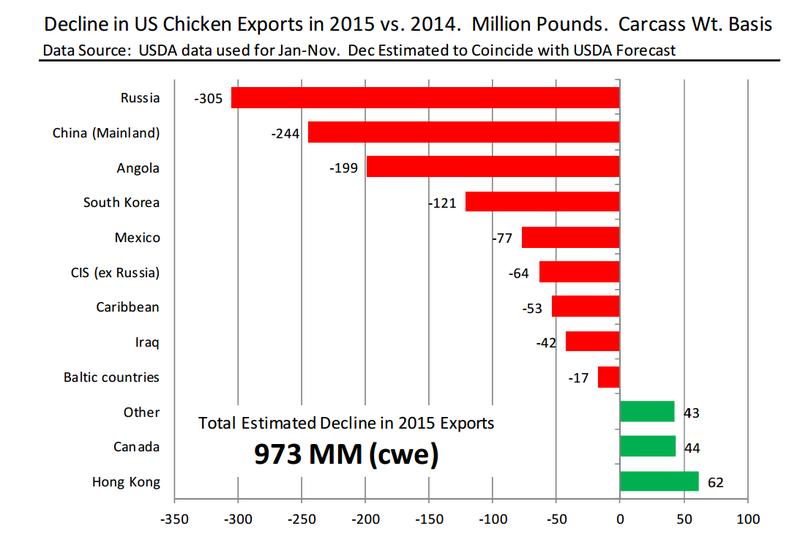 The last U.S. Department of Agriculture forecast estimated 2015 U.S. chicken exports at 6.326 billion lb. — 973 million lb. less than the previous year. Steiner and Meyer provided a chart showing how that decline breaks down by country (Figure). For 2016, USDA expects U.S. chicken exports to gain back a little more than a half-billion pounds of the exports lost in 2015, but at 6.85 billion lb., U.S. chicken exports still will be quite a bit lower than what they were in 2014, Steiner and Meyer noted. USDA has forecasted domestic broiler production in 2016 to increase a modest 2.2% due to a combination of heavier bird weights and higher slaughter numbers. That increase represents an additional 856 million lb. of product, according to Steiner and Meyer. When combined with all the chicken already accumulated in cold storage, an additional 1 billion lb. of chicken will be looking for a home in 2016, they said, adding that, at this point, only half of this supply is expected to be absorbed by the increased exports.